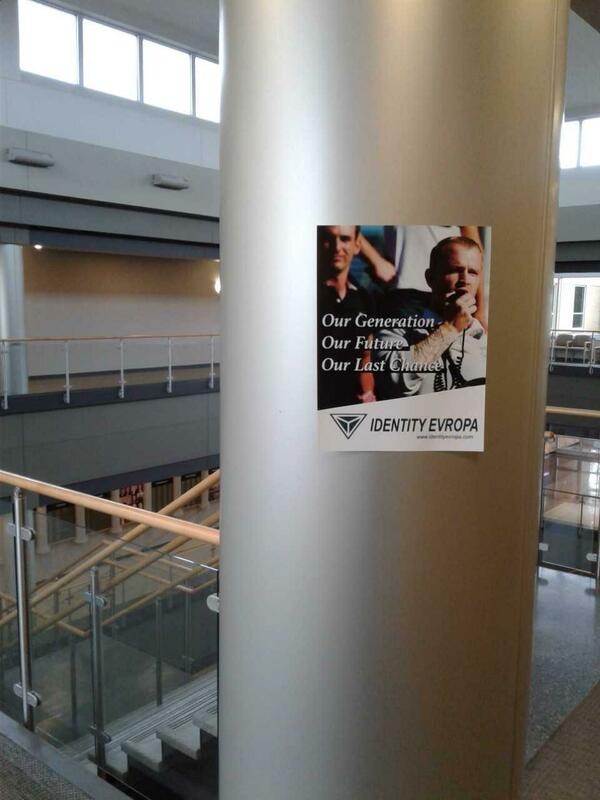 An NIU student, who asked to remain anonymous, took photos of a poster from Identity Evropa in a campus building before it was removed. Someone has been posting flyers promoting a white-supremacist group across the Northern Illinois University campus, Acting President Lisa Freeman informed the community by email Tuesday. She said the flyers are being removed as they are discovered because they violate the NIU posting policy. “Hatred is not something that aligns with the principles of NIU,” Freeman wrote. The flyers, which have been found in at least three academic buildings, promote the organization Identity Evropa, which the Southern Poverty Law Center has labeled a hate group that targets universities. NIU officials say no one actually was caught posting the materials across campus. Campus police say they are not investigating the postings as a criminal matter, since it’s not against the law to post materials on campus. Amirius Clinton, chairman of the NAACP’s NIU student chapter, says the posted materials raised questions for students -- like what made the hate group come to the campus and whether they were invited by someone from NIU. Clinton acknowledges that the hate group does have the first-amendment right to post flyers, but he says many students are scared and perceived the materials as threatening. Christine Wang, Speaker of the NIU Student Senate, says in researching the group, she found social media posts that were anti-Semitic and called for ethnic cleansing. Wang encourages students to speak up if they witness discrimination. Freeman also urged students to report any incidents of bias to the Office of Academic Diversity, Equity and Inclusion. Threats or acts of violence should be reported to NIU police. Copyright 2017 Northern Public Radio. To see more, visit Northern Public Radio.